“Believe” is a term we can all relate to, especially during the holiday season. Believe it or not, TWO MEN AND A TRUCK® can help you prep for the holidays, protect your decorations, and help you stay organized for years to come. While preparing your home for the holidays is an exciting task that can involve the entire family, just thinking about hauling out the decorations from wherever they are stored can be a stressful endeavor. We’ve complied a few tips to help organize and store your decorations for years to come. After all, we’re the experts! Pack perfectly: When packing up your picture frames, candles, and other non-festive items to make way for your holiday décor, try using one of our dish pack boxes. These are perfect since they’re double corrugated boxes making storage of heavy items safe to lift without worrying about the bottom dropping out of the box. 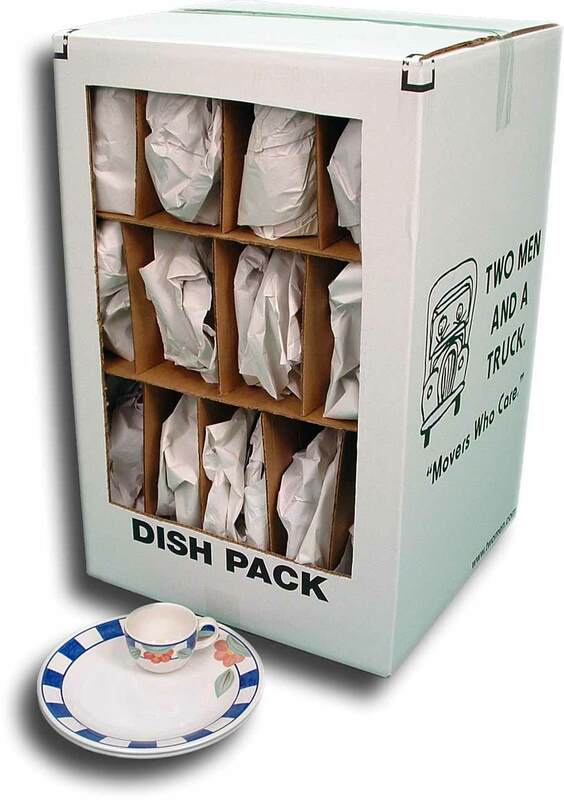 The dish pack also comes with adjustable cubbies making it ideal for storing smaller, fragile items. Just wrap each item with packing paper then place it in its designated cubby and it will be safe. Keep it clean: Are you having a holiday party and don’t want to completely trash your floor? We have a 25 foot roll of clear, adhesive carpet shield you can place over your floor in high traffic areas. You can customize the size by cutting it for the front door area or around the designated kids’ table! Hire moving muscle: Do you wish you could rearrange your furniture to make way for holiday decorations but the thought of moving your heavy couch deters you from such a task? Give us a call to schedule your internal move. We are happy to rearrange any heavy furniture as our movers are professionally trained and will move the same piece until you are happy with its final resting place. When you are scheduling your internal move, don’t forget to schedule a time for us to come back after the holidays to move the furniture to its original position. Don’t risk ruining your holiday fun by hurting yourself. We are happy to help! Believe it! We offer many practical products that are ideal for packing up seasonal items. These products come in various sizes and are ideal for all of your packing and storing needs. Make TWO MEN AND A TRUCK® your one-stop shop for all of your holiday needs this year!